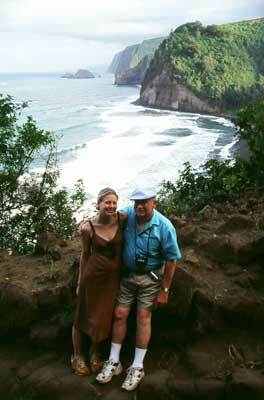 On the left, my sister, Christina, and my dad, another Ray, on the hike into the Pololu valley. 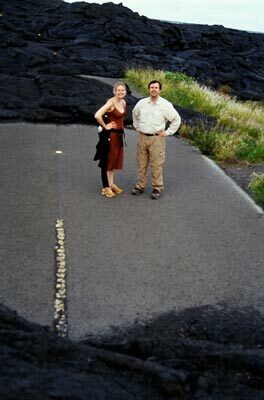 On the right, Christina and me in a kipuka while hiking across the pahoehoe to see new lava flowing into the ocean. 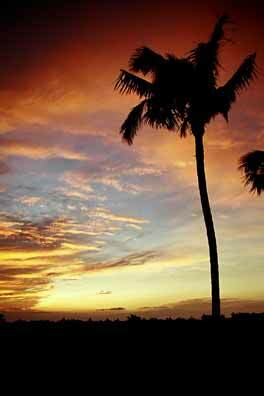 Kipuka is the Hawaiian word for an 'island' of undisturbed land surrounded by lava flows. Pahoehoe is lava hardened into a smooth, undulating or ropy surface. Lava flowing down the mountainside from the active Pu'u O'o vent. We hiked over 3 miles of the hard pahoehoe in the foreground to get close to where this hot lava emptied into the ocean. 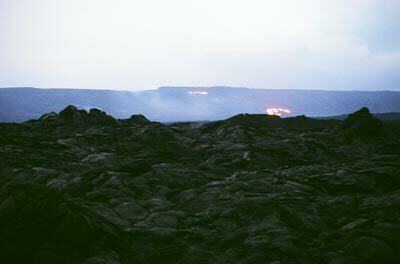 You have to be there at sunset to see the glow of the lava, and that means walking back in the dark. A fascinating experience, but the return trip is treacherous. Below and left, the view from our hotel room balcony. 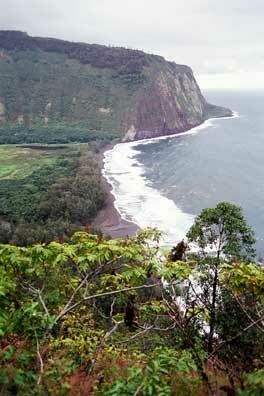 On the right is the view from the top of the road into the Waipi'o valley. I spent my last day of the trip hiking through this valley. 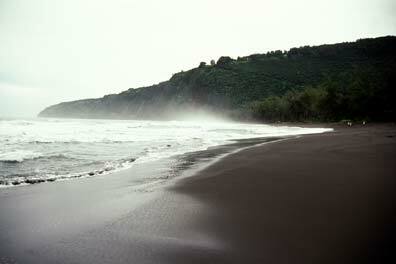 The black sand beach is the one visible from the overlook, above. 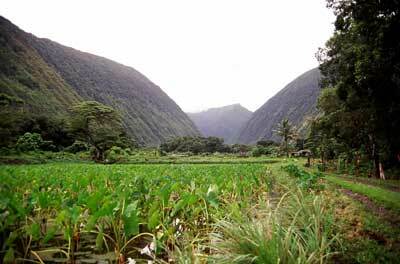 Farmers grow taro in the valley. Taro is the primary ingredient for poi, but I like taro chips. The was fruit growing everywhere in the valley, and I picked and ate ripe oranges and limes from trees hanging over the trail. 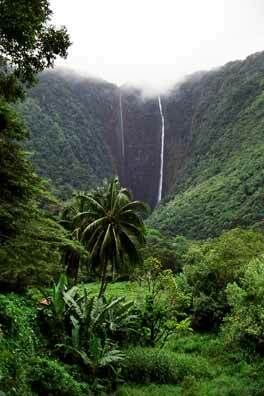 Above are the Hi'ilawe Falls in Waipi'o. As I was walking down the (incredibly steep) road into the valley, I met a couple of tourists coming up. They said to turn right at the bottom of the hill, which would take me to the beach. Instead I turned left and spent hours, mostly lost, in the back of the valley. I came upon the falls, and had to wade through the creek (on the right) that flows from the falls. 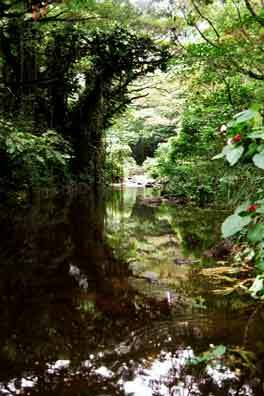 There were so many little creeks and rivers that I spent most of the day barefoot. 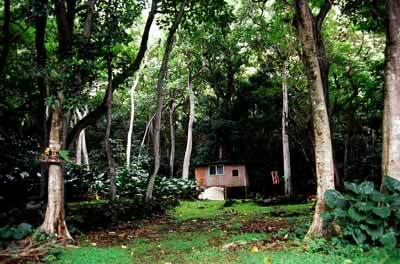 A typical cottage in Waipi'o. I met several of the locals, who said that about 100 people live in the valley. One woman said you need a certain kind of craziness for it.